The success of combination antiretroviral therapy in the treatment of HIV-1–positive individuals has shifted clinical attention toward combination antiretroviral drug regimens that optimize tolerability, long-term safety, and durable efficacy. Wherever patients have access to treatment, morbidity and mortality are increasingly driven by non–HIV-associated comorbidities, which may be observed earlier than in age-matched controls and despite the best available combination antiretroviral therapy. Similarly, HIV-1–positive individuals are now diagnosed and treated earlier with anticipated lifelong therapy. The contribution of specific antiretroviral agents to long-term morbidity and mortality is dependent on the pharmacologic characteristics of these agents, and it is increasingly important in this context. Ever since the first report by the New York Times on a mysterious illness in 1981 and the identification of HIV-1 as the cause of this illness in 1983, significant strides have been made in the treatment and management of HIV-1 (Figure 1). Since the introduction of combination antiretroviral therapy in the mid-1990s, there have been >30 agents approved for the treatment of HIV-1–positive individuals. Diary of key sentinel timeline events from discovery to evolution of therapy of HIV-1. AZT, Zidovudine. The HIV life cycle (Figure 2) entails seven steps, including binding, fusion, and entry of virions to the host cell membrane (step 1); release of single-stranded RNA into the cytoplasm (step 2); transcription from RNA to DNA by reverse transcription (step 3); translocation of DNA to the nucleus and integration to the host DNA (step 4); transcription of mRNA coding for viral proteins (step 5); translation to proteins and post-translational cleavage by HIV protease (step 6); and viral maturation and budding (step 7). 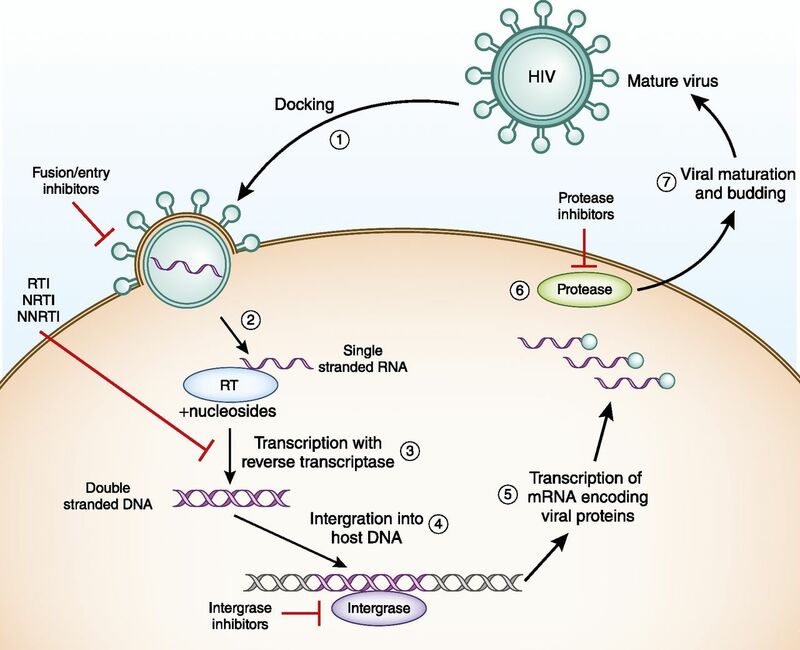 Targeting HIV-1. HIV-1 life cycle and classes of antiretroviral agents that interfere with these specific steps. The seven steps in the HIV lifecycle are identified by numbered circles. Classes of antiretroviral drugs are shown as red lines near the life cycle step that they inhibit. NNRTI, non-nucleoside reverse transcription inhibitor; NRTI, nucleoside reverse transcription inhibitor; RT, reverse transcription; RTI, reverse transcription inhibitor. There are five main classes of combination antiretroviral therapy drugs (1) that target distinct steps of the HIV-1 cycle. One class contains agents that interfere with viral entry (entry inhibitors) into the cell by binding to viral envelope proteins and preventing attachment and entry into CD4 cells via two discrete phases in viral entry: cellular chemokine receptor 5 binding and membrane fusion. A second class contains agents that inhibit viral replication by chain termination after being incorporated into growing DNA strands by HIV-1 reverse transcription (nucleoside reverse transcription inhibitors [NRTIs]). A third class, non-nucleoside reverse transcription inhibitors (NNRTIs), is like NRTIs in that they also interfere with reverse transcription, although they do so by binding reverse transcription at a different site than NRTIs; therefore, they have no cross resistance with the NRTI class. A fourth class (integrase strand transfer inhibitor [INSTIs]) contains agents that inhibit viral DNA insertion into the host cellular genome. A fifth class (protease inhibitors [PIs]) contains agents that inhibit the protease enzyme, which plays a key role in the assembly of the new virus particles. Despite the plethora of agents targeting distinct stages of HIV-1 cycle (Table 1), current national and international guidelines (2,3) now recommend a combination regimen on the basis of the INSTI drug class in combination with reverse transcription inhibitors (RTIs) as initial therapy for most people with HIV. In certain clinical situations, NNRTIs and PIs coadministered with cytochrome P4503A (CYP3A) inhibitors (pharmacoenhancers) are recommended (2). The fundamental goals of these guidelines are to maximally and durably suppress plasma HIV-1 RNA, restore and preserve immunologic function, reduce HIV-1–associated morbidity and prolong the duration and quality of survival, and prevent HIV transmission (2). From the kidney standpoint, many of these agents are secreted or cleared by the kidney, requiring dose adjustments in those with compromised kidney function, and they have drug-drug interactions that may increase the effect of adverse reactions, particularly in HIV-1–positive individuals undergoing organ transplantation (4,5). Likewise and equally important, some of these agents have been shown to be directly nephrotoxic, inducing a variety of kidney disorders ranging from AKI, acute interstitial nephritis, kidney stones, crystalline nephropathy, and CKD to proximal and distal tubular kidney dysfunction (1,6–11). Understanding the pharmacologic characteristics of these agents is essential in this context. This concise review focuses on the pharmacologic aspects of the most widely used combination antiretroviral therapy from a nephrocentric viewpoint. Key pharmacologic elements of these agents are shown in Table 2. Mechanistically, RTIs inhibit transcription of viral RNA into proviral DNA. The class includes NRTIs, for which zidovudine is the prototype, and NNRTIs, for which nevirapine is the prototype. In the United States, commercially available NRTIs include abacavir, emtricitabine, didanosine, lamivudine, stavudine, and zidovudine. Tenofovir, which is available as the prodrugs tenofovir disoproxil fumarate (TDF) and tenofovir alafenamide fumarate (TAF), has a phosphate group bound to the nitrogenous base; as such, these drugs are nucleotide rather than nucleoside analogs. The NRTI class has been historically associated with mitochondrial toxicity, which was once regarded as the most significant adverse effect, with various manifestations, such as hepatic steatosis with lactic acidosis, myopathy, peripheral neuropathy, and lipoatrophy. Abacavir is a powerful NRTI that has been marketed since 1999. After it is absorbed, abacavir is extensively metabolized, with <2% of an oral dose being excreted into the urine as parent drug. It is metabolized mainly by glucuronidation (36%) and alcohol dehydrogenase (30%) and has a serum t1/2 of the active moiety of 21 hours (12). Consequently, abacavir exposure is increased with ethanol use. However, abacavir is associated with no other significant drug interactions, because it is not a significant substrate, inhibitor, or inducer of any members of the CYP family, which makes it an attractive choice for patients receiving other CYP substrates (13). As with other NRTIs, abacavir is phosphorylated intracellularly to an active metabolite. The phosphorylation effectively “traps” the drug within cells. Abacavir administration has been associated with serious and sometimes fatal hypersensitivity reactions. The pathogenesis is related to its binding with high specificity to the HLA-B*5701 protein, changing the shape and chemistry of the antigen binding cleft. This results in a change in immunologic tolerance and the subsequent activation of abacavir-specific cytotoxic T cells, which produce the abacavir hypersensitivity syndrome (14). As such, the presence of the HLA-B*5701 gene allele is associated with elevated odds of developing a hypersensitivity reaction, and screening for this gene allele before prescribing abacavir reduces the incidence to nearly zero (15,16). Abacavir in combination with dolutegravir and lamivudine is one of the initial recommended combination regimens (only for patients who are HLA-B*5701 negative) in most people with HIV (2). In pharmacokinetic studies performed in individuals with CKD with either creatinine clearance <60 ml/min or on hemodialysis who had received abacavir for at least 2 months (17), there were no observed changes in pharmacokinetic parameters. It is, therefore, an attractive choice in patients with CKD. Lamivudine is a dideoxynucleoside analog RTI that is frequently combined with other antiretroviral drugs in fixed dose combination tablets. Most of lamivudine is phosphorylated intracellularly to an active metabolite, which has a t1/2 of 12–18 hours (18). Kidney clearance is the major route of lamivudine elimination, with a short t1/2 of 5–7 hours in the setting of normal kidney function (19). After oral administration, approximately 70% of the total dose is excreted unchanged in the urine by active organic cationic secretion, and only 5%–10% undergoes hepatic metabolism to form a trans-sulphoxide metabolite, which is then also eliminated by the kidney. Interactions with other drugs that are actively secreted via the organic cationic transport system (e.g., trimethoprim) should be considered, although lamivudine has few clinically significant drug interactions. The pharmacokinetics of lamivudine are profoundly affected by decreased kidney function. Consequently, dose adjustment is recommended for creatinine clearance <50 ml/min (20). Intermittent hemodialysis does not reduce lamivudine exposure to a clinically significant degree (19). Therefore, after the dose of lamivudine is adjusted to the degree of kidney dysfunction, on the basis of creatinine clearance, no further modification of dose is required for subjects undergoing routine transient (<4 hours) hemodialysis, and supplementary dosing to account for the dialysis session is not required. Emtricitabine is a cytosine nucleoside analog with structural similarity to lamivudine, which allows these agents to be used interchangeably. Less than 4% of emtricitabine binds to human plasma proteins. After a single oral dose, the plasma emtricitabine t1/2 is approximately 10 hours, and the drug is mainly eliminated by the kidney by a combination of glomerular filtration and active tubular secretion (21). Emtricitabine is not an inhibitor of human CYP; approximately 86% is recovered in the urine, and 14% is recovered in the feces. No significant drug interactions have been reported with emtricitabine. As shown in Table 1, emtricitabine is one of the most commonly used agents in a number of combined formulations. TDF (Viread) is a prodrug for tenofovir, an acyclic nucleotide diester analog of AMP that acts as a potent competitive inhibitor of HIV-1 and hepatitis B virus reverse transcription. TDF is used alone in monoinfected patients with HBV or in combination with other ARVs for treatment of HIV-1. Combinations include efavirenz/emtricitabine/TDF (Atripla), emtricitabine/rilpivirine/TDF (Complera), and emtricitabine/TDF (Truvada). Because of its high barrier for the development of viral resistance mutations, long plasma and intracellular t1/2 (14–17 and >60 hours, respectively), and overall tolerability, TDF is the most widely used antiretroviral agent, although it is substantially being replaced by TAF (discussed below). TDF is rapidly (<1 minute) converted to tenofovir in plasma, and subsequently, it is metabolized intracellularly to the active metabolite, tenofovir diphosphate (TFV-DP), that incorporates into proviral DNA and impairs its transcription (22). TDF does not modify the metabolism of other drugs, and its metabolite tenofovir is primarily eliminated unchanged in urine by both glomerular filtration and active proximal tubular secretion (22). As shown in Figure 3, tenofovir (about 20%–30%) is actively transported across the basolateral membrane into the proximal tubular epithelial cells by organic anion transporters (OATs) (23), with active efflux into the tubular lumen across the apical membrane via the multidrug resistance proteins transporters (24). As such, the proximal kidney tubule is the target for tenofovir-associated nephrotoxicities (1,25,26). The pathogenesis of nephrotoxicity is potentially a consequence of effects on the proximal tubule epithelial cell mitochondria and altered mitochondrial cytochrome c oxidase activity (27,28) as well as its downregulatory effect on endothelial nitic oxide synthase, variety of ion transporters, and decreased expression of megalin and cubilin (25,28). Histologically, like other forms of toxic AKI, evidence of proximal tubular injury can be recognized by light microscopy. However, it is the proximal tubular eosinophilic inclusions representing giant mitochondria that are considered distinctive features seen with tenofovir nephrotoxicity (27). By electron microscopy, these changes in proximal tubular cells mitochondria architecture characteristic of tenofovir nephrotoxicity can also be recognized, including autophagosomes and dysmorphic mitochondria of variable sizes, shapes, and incomplete cristae (27,29). Use of TDF with PIs, such as atazanavir or ritonavir, increases TDF drug concentrations and boosts its potential for nephrotoxicity and incident CKD (8). Other risk factors for TDF-induced proximal tubular injury include aging, immunodeficiency, diabetes mellitus, preexisting kidney disease, polymorphisms of transporters involved in drug secretion by the kidney, prolonged exposure, and concomitant use of didanosine or PIs (5,7,30). Severe proximal tubular injury may progress to eGFR decline, osteomalacia, and pathologic fractures. As such, guidelines have recommended avoiding TDF use in HIV-1–positive people who have a GFR<60 ml/min per 1.73 m2 (4). No studies have specifically examined the safety of continued TDF use in individuals with evidence of proximal tubular dysfunction but preserved eGFR. Consequently, in TDF-treated individuals who experience a confirmed eGFR decline by >25% from baseline and to a level <60 ml/min per 1.73 m2, it is recommended to substitute alternative antiretroviral drug(s) for TDF, particularly in those with evidence of proximal tubular dysfunction, such as euglycemic glycosuria or increased urinary phosphorus excretion, hypophosphatemia, or new-onset or worsening proteinuria (4). The proximal kidney tubule is the target for tenofovir-associated nephrotoxicities. Handling of tenofovir (TFV), the active metabolite of tenofovir disoproxil fumarate (TDF) and tenofovir alafenamide fumarate (TAF), by the proximal tubular cells of the kidney. TFV exits the tubular circulation primarily via the organic anion transporter 1 (OAT1) on the basolateral membrane, and after it is within the cell, it exits into the urine via the apical multidrug resistance protein type 4 (MRP 4) and possibly, MRP 2. TAF is more stable in plasma than TDF, with minimal hydrolyses to TFV. The bulk of TAF is rather transported to target cells. MATE1, multidrug and toxin extrusion transporter 1; OCT2, organic cation transporter 2. It is generally recommended that TDF be dosed once weekly in HIV-positive individuals on maintenance hemodialysis. However, a recent pharmacokinetic study determined that once weekly dosing with hemodialysis resulted in steady-state plasma and intracellular peripheral blood mononuclear cell (PBMC) concentrations that are higher than those found in patients with normal kidney function who are taking TDF daily (31). This suggests that less frequent dosing of TDF may be appropriate in patients on dialysis, but further evaluation is required. TAF (formerly GS-7340) is the next generation tenofovir prodrug that has a distinct metabolism, and it was designed to maximize antiviral potency and clinical safety. The Tmax of TAF is approximately 2 hours, and compared with TDF, TAF is much more stable in the plasma, with a t1/2 of 90 minutes. This is related to the presence of a phenol and an alanine isopropyl esther in its structure. TAF penetrates inside cells, where cathepsin A hydrolyses it to tenofovir, which is subsequently phosphorylated to TFV-DP (32). This results in higher intracellular concentrations of the active phosphorylated moiety TFV-DP and lower circulating concentrations of tenofovir relative to TDF. Improved kidney safety is likely attributable to lower circulating plasma concentrations of tenofovir. The hydrolysis of TAF within cells is more rapid compared with TDF, and its t1/2 within T cells is 28 minutes. A radiolabeled distribution study in dogs showed that, on a dose per dose basis, TAF administration leads to an increased distribution of tenofovir to tissues of lymphatic origin compared with TDF (33). Because tenofovir is actively transported from the blood into proximal tubule kidney cells by OAT1 and OAT3, a reduction in plasma exposures of tenofovir may result in lower concentrations in proximal tubule cells and less nephrotoxicity (34). In addition, there is no evidence of proximal tubular kidney cell uptake of TAF via OAT1 and OAT3, suggesting less tubular cell accumulation and nephrotoxicity (35). Thus, an optimized dose of TAF could result in improved clinical efficacy and long-term safety relative to TDF. TAF dosing at 25 mg has substantially reduced tenofovir exposures, with improved pharmacodynamics compared with 300 mg TDF (36). Compared with 300 mg TDF, TAF showed more potent antiviral activity, higher PBMC intracellular TFV-DP concentrations, and lower plasma tenofovir exposures at approximately 1/10th of the dose. Administration of TAF 25 mg leads to higher intracellular concentrations of TFV-DP in PBMCs and 86% lower plasma concentrations of tenofovir than TDF 300 mg. TAF is excreted mainly in the urine and feces, predominantly as tenofovir (36). Both drugs were compared in randomized phase 2 and phase 3 studies. In HIV-naïve patients, TAF and TDF showed a similar efficacy for viral control at 48 weeks. However, TAF was associated with a favorable proximal tubular kidney injury profile and a smaller decrease in eGFR compared with TDF (37). Similar observations were made in experienced patients in switch studies, where TAF replaced TDF (38). Despite the favorable kidney safety indicators from large clinical trials, TAF may potentially be nephrotoxic in persons with comorbid conditions, such as chronic liver disease and diabetes mellitus, as recently reported (29). Consequently, longitudinal follow-up studies will be required to ascertain the nephrotoxicity potential, if any, of TAF and its beneficial effect over TDF (39). TAF metabolites are excreted in the urine and feces, and dose adjustment is not required in CKD when the creatinine clearance is 30 ml/min or higher. In a small study of patients with clearances lower than 30 ml/min, TAF plasma exposure increased only moderately. However, the drug has not been evaluated in patients on dialysis. TAF is used in multiple single-tablet combinations, including Genvoya (elvitegravir, cobicistat, emtricitabine, and TAF), Odefsey (emtricitabine, rilpivirine, and TAF), and Descovy (emtricitabine and TAF). TAF, like TDF but to a lower extent, is a substrate of P-glycoprotein (P-gp) and human breast cancer resistance protein (BCRP). As such, inhibitors of BRCP and P-gp have a lower influence on TAF compared with TDF, and inhibitors of these proteins may be used with TAF if needed. An example of this is ledipasvir, an agent that inhibits the nonstructural gene component of hepatitis C (NS5A) involved in replication pathways of the virus, which is used in combination with sofosbuvir for the treatment of chronic hepatitis C, a commonly encountered comorbidity in HIV-1–positive individuals. Ritonavir and Cobicistat will increase TAF plasma levels approximately twofold via the inhibition of the intestinal P-gp (40). It is recommended that the 10-mg dose of TAF be used when administered with a boosted PI (cobicistat or ritonavir), whereas the 25-mg dose is safe when combined with NNRTIs or INSTIs. Although TAF is not considerably metabolized by CYP, it is not recommended to use with CYP or P-gp inducers. INSTI coadministered with two NRTIs is now the most common first-line strategy for naïve HIV-1–positive individuals recommended by the US Department of Health and Human Services adult and adolescent HIV treatment guidelines (2). The transition from NNRTI- and PI-based regimens to INSTI-based ones was driven by improved efficacy, safety, and tolerability profiles and fewer drug-drug interactions, including the CYP3A4-drug interactions. Consequently, these agents, in combination with RTIs, are the preferred antiretroviral agents to use in HIV-positive individuals undergoing organ transplantation (21). There are four agents in this class, and the first clinically available agent, raltegravir, was approved in 2007. This was followed by approval of the second generation INSTIs elvitegravir in 2012, dolutegravir in 2013, and most recently, bictegravir in 2018. They act by inhibiting viral DNA incorporation into the host genome (41). Raltegravir is a first generation INSTI that characteristically has highly variable pharmacokinetics both between patients and within the same patients on different days (42), dictating twice daily dosing (43). Raltegravir is metabolized by glucuronidation, primarily by uridine glucuronosyl transferase 1A1 (UGT1A1) (44). Compared with raltegravir and dolutegravir, which possess minimal CYP involvement, elvitegravir metabolism occurs primarily via CYP3A4 and requires pharmacokinetic boosting to achieve systemic exposures that permit once daily dosing. Consequently, elvitegravir is coformulated with cobicistat (either as elvitegravir/cobicistat/TDF/emtricitabine or elvitegravir/cobicistat/TAF/emtricitabine) or must be used with ritonavir. Dolutegravir is highly potent and dissociates more slowly from integrase-DNA complexes than first generation INSTIs. Dolutegravir is readily absorbed, with Tmax of 0.5–2 hours. Its t1/2 is 11–12 hours in HIV-1–positive individuals. The drug is mainly protein bound, and it is a substrate for P-gp and BCRP. Dolutegravir is predominantly metabolized in the liver via UGT1A1, and its urinary excretion is <1% (45,46). Multiple drugs interact with dolutegravir by altering UGT1A1, such as some NNRTIs (EFV, DRV, ATV, etc. ), but no significant interaction has been described with TDF or TAF (47). Although it has no reported effect on the CYP system or drug transporters, dolutegravir inhibits organic cation transporter 2, which is responsible for creatinine uptake at the basolateral membrane of the proximal tubular kidney cells as shown in Figure 4 (48). As such, dolutegravir has been shown to raise serum creatinine by up to 0.4 mg/dl (44 μmol/L) with predictable decrease in eGFR by 10–15 ml/min per 1.73 m2 without altering true GFR (49). Under steady state, such change may be manageable in those with normal kidney function but could be challenging in those with underlying CKD. However, no kidney toxicities have been described with the use of this agent. Given its hepatic metabolism, no dose adjustment is required in those with kidney disease. However, dolutegravir exposure may be decreased by severe kidney impairment (50). Although it has not been systematically evaluated in those receiving kidney replacement therapy, given its high protein binding, it is not expected to be removed by dialysis (51). Dolutegravir is an attractive choice for HIV-1–positive individuals undergoing organ transplantation given the lack of documented interactions with calcineurin inhibitors (30). Agents that interfere with creatinine secretion in proximal tubule raising its actual serum value. Creatine is secreted at the basolateral membrane via the organic cation transporter 2 (OCT2), and both dolutegravir and rilpivirine and commonly used drugs compete with this process. Creatinine exits the proximal tubular cells via multidrug and toxin extrusion transporter 1 (MATE1). Pharmacoenhancers cobicistat and ritonavir compete with this step as well as other drugs. MRP 2, multidrug resistance protein type 2; MRP 4, multidrug resistance protein type 4; OAT1, organic anion transporter 1; OAT3, organic anion transporter 3; TFV, tenofovir. Because of lipodystrophy, which is manifested by lipoatrophy and/or lipid accumulation in the trunk, the use of PIs as part of combination antiretroviral therapy has significantly declined. Another major limiting toxicity is the high incidence of crystallization within kidney tubules and nephrolithiasis with one of the most potent PIs, indinavir (9) in addition to unconjugated hyperbilirubinemia and nephrolithiasis with atazanavir use. Risk factors for nephrolithiasis with the use of indinavir and atazanavir include alkaline pH, low lean body mass, using higher doses, adding a pharmacologic boosting agent, warm climates, and suboptimal daily fluid intake (1). Both agents are also associated with significant tubulointerstitial disease and increased risk for incident CKD (52). The use of atazanavir in conjunction with ritonavir as a booster has the potential of increasing the risk for the development of granulomatous interstitial nephritis (53–55). Similar to pharmacoenhancers, these agents are not recommended in those undergoing organ transplantations because of the significant drug-drug interactions with calcineurin inhibitors and mammalian target of rapamycin inhibitors (5,56). Likewise, awareness of other potential drug interactions with these agents is critical in predicating safety and efficacy of other concomitantly administered drugs. Nephrologists are encouraged to use resources dealing with HIV-specific drug interactions, such as www.hiv-druginteractions.org, for up to date information. Cobicistat is used as an inhibitor of CYP, leading to higher plasma concentrations of antiretrovirals metabolized by this enzyme. It has no direct antiretroviral activities in contrast to ritonavir (which is also used principally for its pharmacoenhancer properties), but the inhibitory effect of cobicistat on CYP is like the one obtained with ritonavir. Cobicistat is, however, more specific for CYP3A than ritonavir, with a lower effect of CYP2D6. It also inhibits P-gp, BCRP, OATP1B1, and OATP1B3 transporters. It is used in conjunction with other antiretroviral drugs as a booster to increase their concentrations (57). Cobicistat is mainly protein bound with a t1/2 of approximately 3–4 hours, and it is primarily excreted in the feces, with only 8% in the urine (58). Given its intended pharmacokinetic effects, cobicistat interacts with numerous drugs metabolized by CYP3A4, 2D6, or P-gp and should not be administered with CYP3A4 enhancers. It increases TAF level approximately twofold via the inhibition of intestinal P-gp, and TAF dose is reduced to 10 mg in cobicistat-containing regimens. Although it has no kidney toxicities, it inhibits creatinine secretion at the apical membrane of the proximal tubular kidney cells by primarily inhibiting multidrug and toxin extrusion transporter 1 and OAT1B1–3. It is, therefore, associated with an average 13% (approximately 10 ml/min) decline in eGFR with no actual kidney injury (59). The rise of serum creatinine with cobicistat is more prominent compared with ritonavir due to its greater inhibition of multidrug and toxin extrusion transporter 1 (60). No dose adjustment is required in CKD. However, in its coformulated tablet elvitegravir/cobicistat/TDF/emtricitabine, it is not recommended in those with creatinine clearance of <70 ml/min and should be discontinued in those with creatinine clearance of <50 ml/min. With the introduction of TAF, the coformulated tablet elvitegravir/cobicistat/TAF/emtricitabine can be used in those with creatinine clearance of 30–69 ml/min (38). There is no experience with this drug at lower levels of kidney function, and drug-drug interactions have not been evaluated (61). Ritonavir, like other PIs (except for nelfinavir), is metabolized by CYP3A4 (major) and CYP2D6 (minor) with a serum t1/2 of 3–5 hours. It is also a strong inhibitor of CYP3A4 (62) and induces its own metabolism (63). However, it is rarely used at doses needed for antiretroviral activity due to near-universal gastrointestinal side effects. Rather, ritonavir is used at low doses with other PIs as a pharmacokinetic enhancer or “booster” to increase concentrations and decrease dosing frequency of other agents. The landscape of combination antiretroviral therapy has progressed markedly over the past 30 years, and it will continue to expand with the potential future introduction of injectable long-acting agents or the preventive treatment with broadly neutralizing HIV antibody therapy, which are both currently under clinical testing. This will likely present a new set of challenges to providers and nephrologists who are required to keep themselves abreast with such an evolving field. M.G.A. was supported by National Institutes of Health (NIH)/National Institute of Diabetes and Digestive and Kidney Diseases grant P01DK056492, NIH grant 7R01 DK103574-03 (subaward EST2041-01), and National Institute on Drug Abuse grant R01DA026770. G.M.L. was supported by National Institute on Drug Abuse grants K24 DA035684 and R01 DA026770 and Johns Hopkins University Center for AIDS Research grant P30 AI094189.